WALK into Books For Cooks. It smells good. You look around. You see shelves crammed with books reaching from floor to ceiling, central tables piled high with yet more books, and you marvel - are all these books really cookbooks? Then, at the back of the shop, you spot the kitchen from which those appetising aromas exude. There is cookery in the air as well as on the shelves of this bookshop. Once discovered, food lovers wonder how they ever survived before Books For Cooks! Books for Cooks was founded in 1983 by Heidi Lascelles. At that time, the whole venture must have seemed highly improbable. British cooking was a standing joke the world over, with London a highly unlikely location for a cook book store. Heidi was neither a trained cook nor professional bookseller. But her time as a nurse had impressed upon her the importance of good food, while her experience as a customer was that the cookery sections of London's famous bookshops were meagre, dusty and relegated to the back of the store. And so, undaunted, Heidi set up shop in a tiny store just over the road from where we now are on Blenheim Crescent. Heidi's aim to stock as many different cookbooks as she could find, and her readiness to track down a wanted book from whatever corner of the globe it came and then to despatch the book to whatever corner of the globe from which it was requested, soon earned the store a large international clientele. Books For Cooks quite soon outgrew its original, diminutive home, squeezed out by cookbooks and customers. And, in the new larger shop across the road, Heidi installed a kitchen where she hoped recipes might be tested and the cookbooks on the shelves brought to life. Rosie Kindersley and Eric Treuille, Books for Cooks' current proprietors, are convinced that the test kitchen is the secret of shop's success. Because of it, they say, "we are able to put theory into practice. Food here is not just something to be perused in books, it is something to be cooked, eaten and enjoyed. We can then really champion the books in which we know the recipes really work. It makes us more than a cook book shop - a shop for all cooks!" The first test kitchen cook was Annie Bell, today a renowned food writer and author of a string of superlative cookbooks. Annie's wonderful cooking drew a faithful following of test kitchen diners, among whom was future "Fat Lady" Clarissa Dickson Wright. Clarissa's original offer to mind the shop for an afternoon became a four-year reign! Clarissa's encyclopaedic knowledge of food and cooking firmly established the store as an internationally renowned epicurean epicentre, while her cardoon crusade brought Sophie Grigson and the TV cameras to Books for Cooks. Rosie arrived in 1992. She walked into the shop as a simple customer but out as a paid up employee when Heidi, who prefers to read faces rather than résumés, offered her a job! A year later Eric walked into Books for Cooks and into Rosie's life. 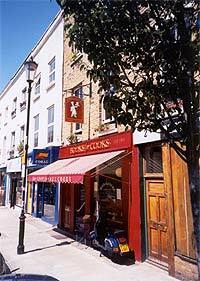 When Clarissa left Books for Cooks in January 1994, Rosie took over the running of the store while Eric ran the test kitchen and started the Books for Cooks workshop programme. And, in February 2001, when Heidi retired from the Books for Cooks (she now lives in Tuscany where she devotes her considerable energy to cookery holidays) Rosie and Eric became the very happy owners of Books for Cooks.